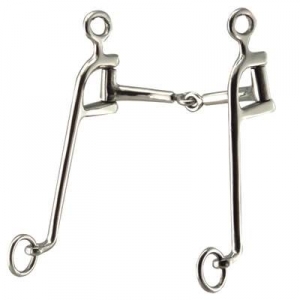 This Robart Pinchless Walking Horse Snaffle Bit is one of our best sellers and we are offering this snaffle bit at a great price. Many of our horse tack products are on sale now. Robart Bits are well known and popular because they use pressure instead of pain to train. We strive to offer the lowest prices for our quality products and your complete satisfaction is our number one priority here at Horse Tack Now. This Walking Horse Snaffle Bit measures 8'' in the shanks.